Winter is almost over and Spring is just around the corner. You may notice as the weather warms up that your lawn is a bit perkier. Don’t let this time get away without properly preparing your lawn for a sunny spring. Here are some things you can do to promote a healthy lawn in New England this spring. It’s time to bring out the rakes again and get rid of dead leaves brought on by the cold New England winter. Hopefully, you’ve already raked up leaves from the fall during your fall landscaping preparation and this task will not be as cumbersome. However, if you weren’t able to perform a fall raking, then you should consider calling your local New England lawn care professional to help with this task. Clearing up dead leaves and other debris from your yard is imperative to achieving a good looking spring lawn. Raking up leaves is not just a matter of looks though. It can be detrimental to the health of your lawn to allow dead leaves to remain. Your lawn needs to breathe! A thick layer of leaves left on your grass can invite pests and diseases that can create serious problems like snow mold and brown patch. Dead leaves can form a barrier that blocks water, nutrients and healthy air flow and can stunt the growth of new grass for the Spring. Inspect your yard for bare patches. Harsh winters can be hard on your lawn especially if it’s been covered in snow. If you find any bare patches, you should apply grass seed and fertilizer. Loosen the surface to about 2 to 4 inches, then level the soil. Spread a mixture of grass seed and fertilizer over the bare spot and pack in the seed. Then water as needed. Next, you should aerate your lawn. This step is important because it will allow oxygen, water, and nutrients to reach grass roots more easily. The easiest way to aerate your lawn is to hire a local landscaping professional, but if you insist on doing it yourself, renting an aerator is the second best choice. As temperatures begin to rise so will those pesky weeds. It’s a good idea to get in front of the weed problem with a pre-emergent herbicide. This product eliminates weeds at the earliest stage of growth before they are visible. It’s important to remember that when using pre-emergent herbicides, timing is of the essence. Crabgrass starts to germinate when the soil temperature is 50 degrees or above for a few days. Therefore, it is better to apply this treatment sooner rather than later. To protect your plants from freezing temperatures you more than likely covered plants with burlap or you may have even brought your plants in from the cold. New England’s last frost date is mid-April. After this date, it is safe to bring your plants out to soak up some much-needed sun and return to their prior glory. Planning your lawn care and gardening strategy ahead of time will make lawn care a cinch for you this spring. 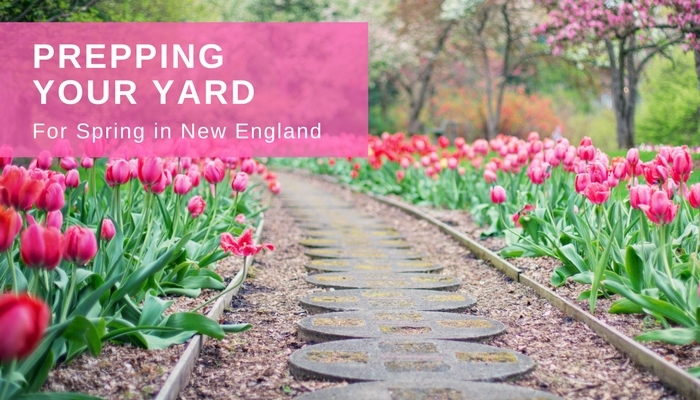 Understanding the New England climate during spring will help you determine what flowers to plant. Average spring temperatures in New England range from the mid-50s to mid-70s. Also be sure to consider how much sun and shade your yard typically receives throughout the day during spring so that you can map out the best locations for a garden. Some ideas for shaded areas include hellebores, ferns, hostas, and campanulas. No Replies to "Prepping Your Yard For Spring In New England"